Sweden’s Persuader is keeping up a nice track record. After the brilliant Evolution Purgatory, which came out of nowhere a year ago and smashed my face in, comes When Eden Burns, a brilliant refinement of the band’s sound and earlier work. The opener Twisted Eyes chugs with mighty riffing and a thundering beat alternating from thrashing to basic rock. 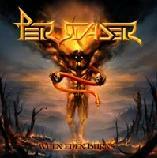 Thrash is also an element that has been multiplying in singer Jens Carlssons awesome voice. While he still occasionally is a dead ringer for Hansi Kursch, he is really beginning to find his own voice with the added harsher stylings. Even occasional screeches that would be right at home on a death metal record come out of his pipes. The song material is a myriad of mixtures from different metal genres. The opener and Slaves Of Labour possess insanely melodic guitar lines that lodge themselves firmly in your head. Gang shouts and choirs layer the catchy choruses all over the album for that power metal feel. Many riffs go into thrash and a few times border black metal. Blastbeats pepper the grand, mid tempo magnificence of the title track. Judas Immortal bursts through the thickest of walls with a manic speed metal gear and then breaks into an acoustic flamenco solo in the middle. The song also has a fabulous chorus – who woulda thunk it? Doomsday News is a marvellous slice of traditional metal locked in pure Maiden-mode, with just a little more double bass and piano. The jagged, groovy riffs in the bridge slay! Zion, a better-than-your-average-instrumental is about the only mediocre song in here. The production is very good and balanced, albeit a bit raw. Then again, the music has gone more aggressive from EP, so it suits the material. I still would have liked a bit more kick in the bass drums, as they just slightly get buried in the mix in the most frantic parts. All in all, Persuader beautifully manages to float well above the large grey mass that litters this type of music that the followers of Blind Guardian and Helloween churn out. I like the gruffer direction a lot and hope that the boys will bring even a bit more death and thrash onto the next album. ‘Till then, Eden will burn with a gigantic flame.